Making throw pillow covers is nearly a seasonal event for me. I think there is no better way to give a quick face-lift to a room and I really enjoy using pillows to celebrate seasons. Summer, of course, is the most fun for this. 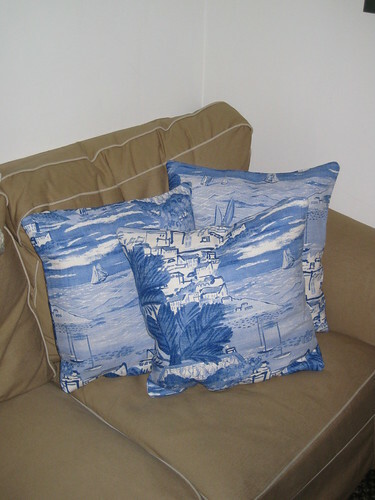 The pillows I made in Spring of 2009 (below) are still some of my favorites! This winter I decided not to use wool, as I have in the past, and instead used a 2-ply jersey from my all-time favorite Banksville Designer Fabrics in Norwalk, CT. The particular jersey is actually from Diane Von Furstenberg – which I think explains the amazing colors! I made these pillows using a box weaving technique. The Jersey is perfect not just for its snuggle factor (it is basically glorified sweatshirt material) but also because it has great stretch and doesn’t fray. That means the pillows can take a beating and you can just wiggle any twisted or shifted pieces back into place. I also made oversized (20″) pillows this time around – so nice this time of year! As you may have noticed from the sidebar on the right, I am currently working on getting an Etsy store up and running! The goal is to launch later this winter with a series of throw pillow covers just like these – just in time for that harsh end of winter when we could all use a dose of bright yellow, orange and red to remind us that Spring is right around the corner!